It’s a great concept place planned perfectly where u can sample food from all Asian countries & different kinds of cuisines within a country as well. 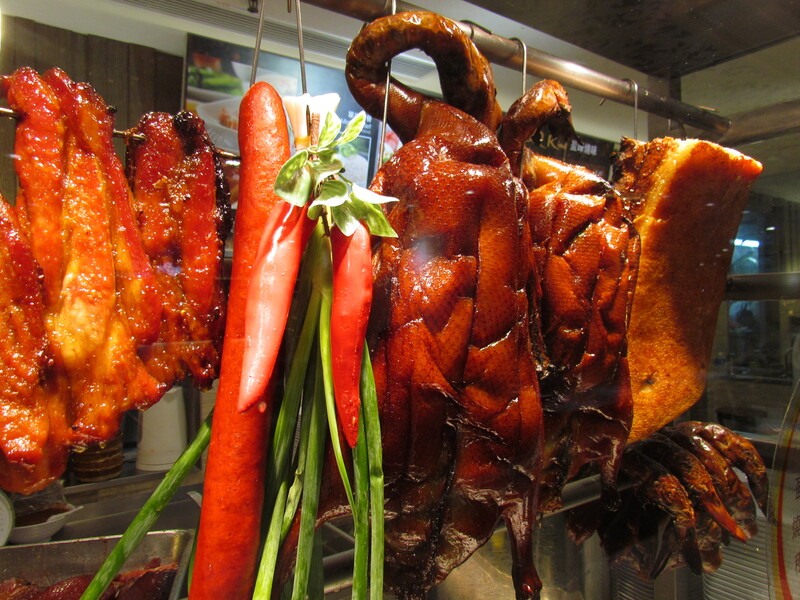 I was wandering in City Plaza Mall in Taikoo Shing, Hongkong, when I noticed a huge corner with food stalls. The foodie in me cud not resist & I walked in. I started looking around at the stalls soon to realize that it was a well-planned & nicely laid out food court. 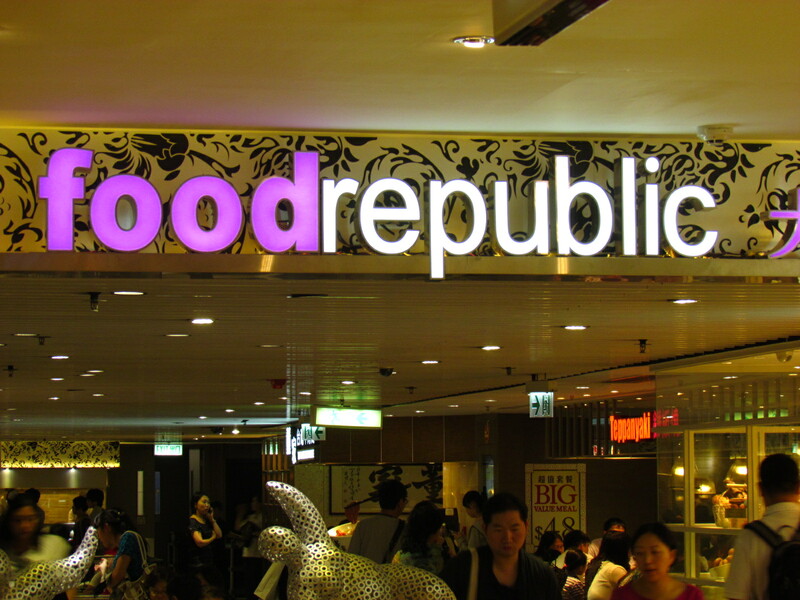 The Design of the food court was uniform for all stalls – in terms of size, façade, Shop fronts etc. This was quite different than the over-cluttered multicolored multi sized facades of stalls in Food courts in India. What impressed me was the fact that the Mall Guys have actually planned the renting out of stalls to ensure that all Countries & the cuisines of Asia (sans Indian subcontinent) are represented. The shops included a Japanese open live teppanyaki counter, a Chicken rice counter (Singapore), a Noodle & congee shop, a Japanese wazen shop – what was been sold here looked like a lunch box (bento box), a Vietnam stall with many ‘pho’ dishes – of diff varieties like chicken, duck, beef, seafood etc, a Chinese stir fry, a Thai stall, a traditional rice noodle house, a ‘in-house made’ Japanese udon noodles stall, a Shanghai & Sichuan counter, a Korean counter, a Dimsum house & a shop selling Taiwanese food. There is a dessert shop as well. I guess it will take a month for a person to xplore all the shops & may be 6 months to try all dishes sold at these shops. 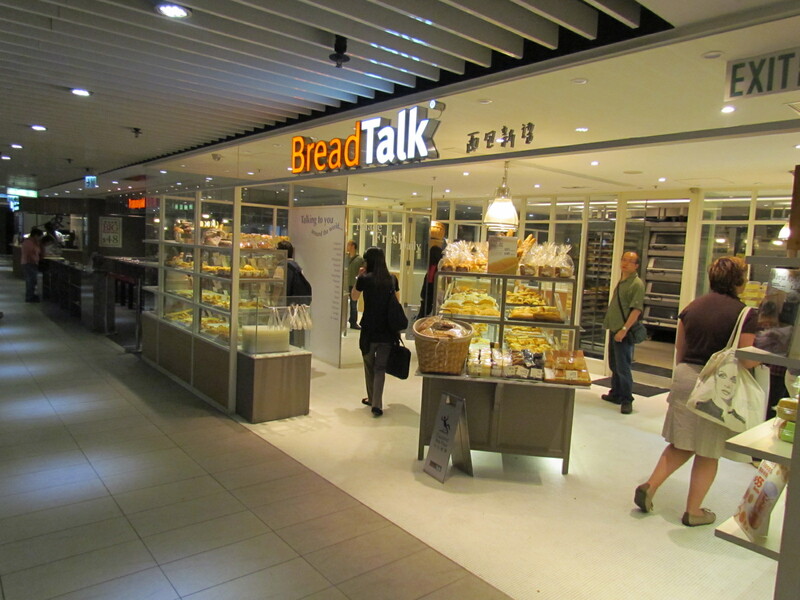 The first shop on the right was Bread Talk that we have at Spencer’s Gurgaon. Till I saw this I had no idea that this Bakery shop in Gurgaon was an International Chain. I must say – amazing variety, amazing planning & great execution & popularity shows – The Food court is always full at meal time. 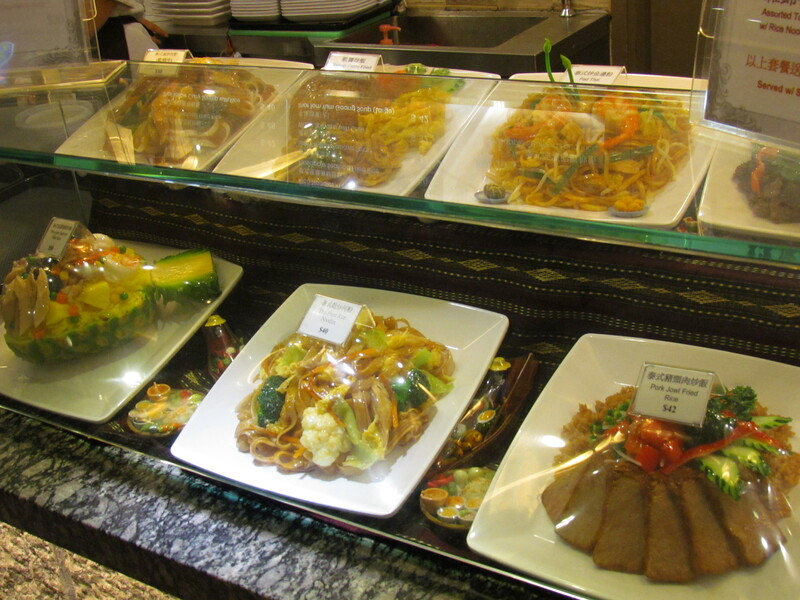 Some stalls had almost real looking plastic look-alikes of the food that was on offer. Some others had all their real roasted food on display. 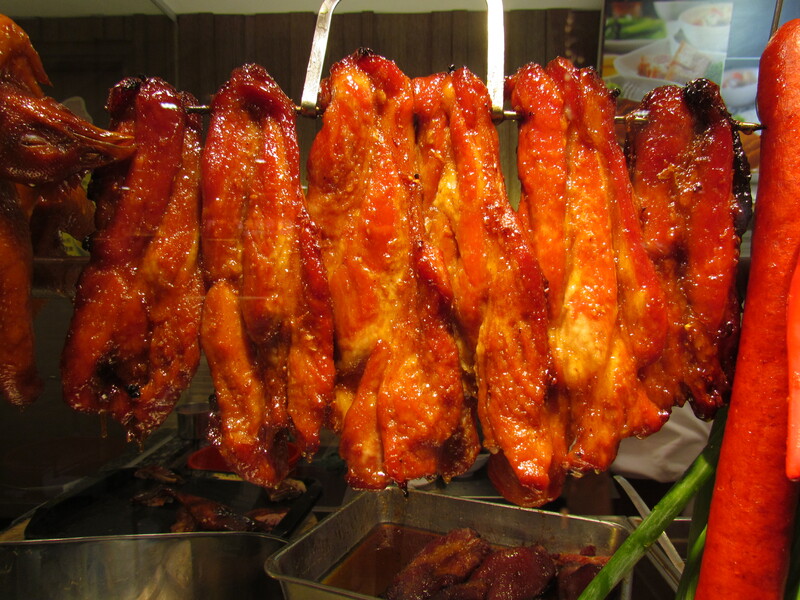 In case u r visiting Hongkong & want to have a taste of Hongkong & other Asian Countries, get to this place. I wud not say that the food served here is the best in their respective category but they are surely good. 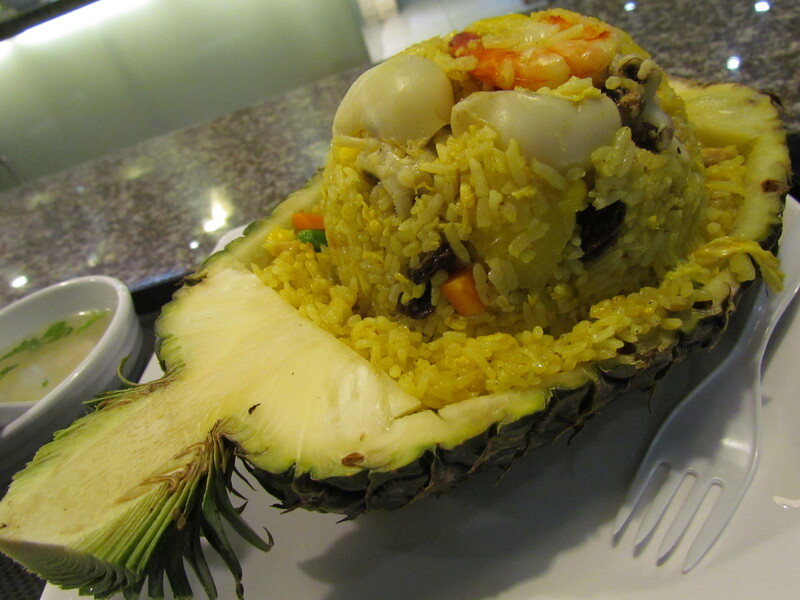 I tried a ‘Seafood rice in pineapple’ from Thai stall – It turned out to be sticky rice cooked with stock, & loads of seafood added to that, served inside a real half pineapple!!! 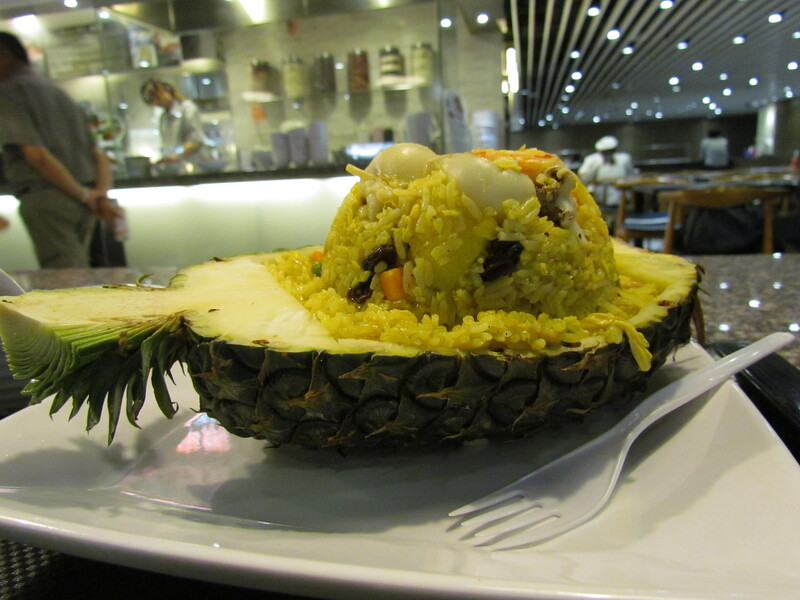 A pineapple was cut into half, the fruit part scooped out, cut into pieces & then added back to the rice. The Pineapple was giving a fruity sour taste. Lots of raisins were also added, thus giving an unexpected ‘sweet’ taste. Lots of corn & carrots were also added. 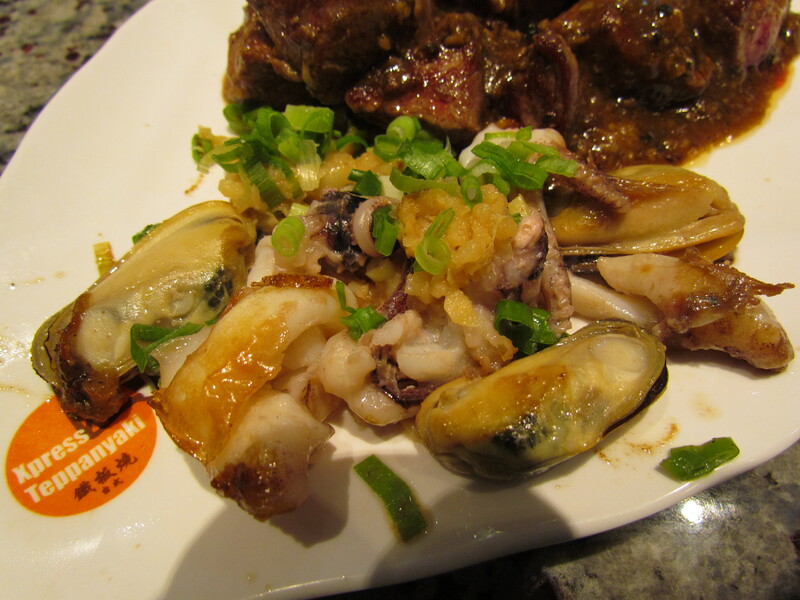 The overall taste was interesting combination of sweet, sour, fruity & also seafood – good. The Only thing about the ‘seafood’ dish that was funny was chicken – don’t know which sea has chicken floating in it!!!! The second thing that I tried was at the Japanese counter – I am a fan of live Teppanyaki grill & I did not want to let go of this experience. For the uninitiated, Teppanyaki is a live metal flat plate on which meats & veggies are put, fried, sauced up & served all in front of u. U actually see the Chef turning raw meats etc to a superb dish right in front of u & it can be really fascinating specially for food lovers like me. 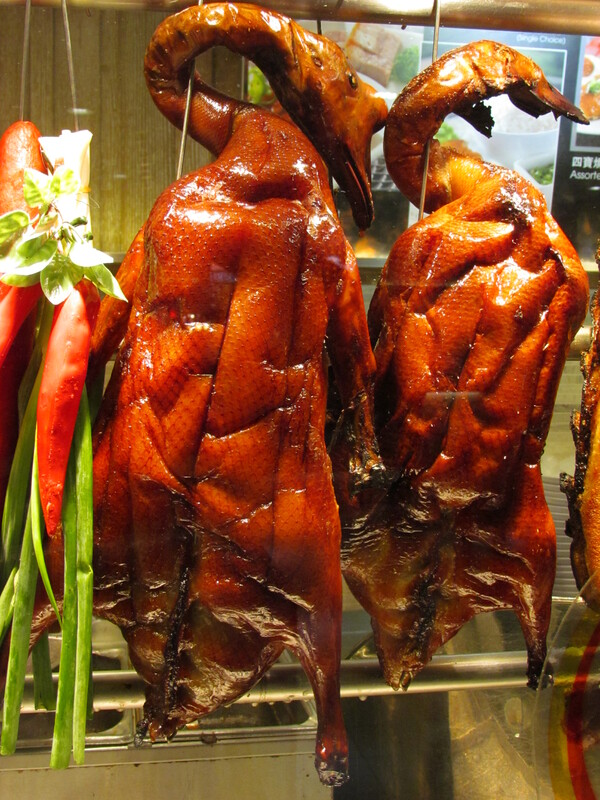 I always admire the ease & the speed with which the Chefs prepare each dish with multiple pairs of eyes staring at them. 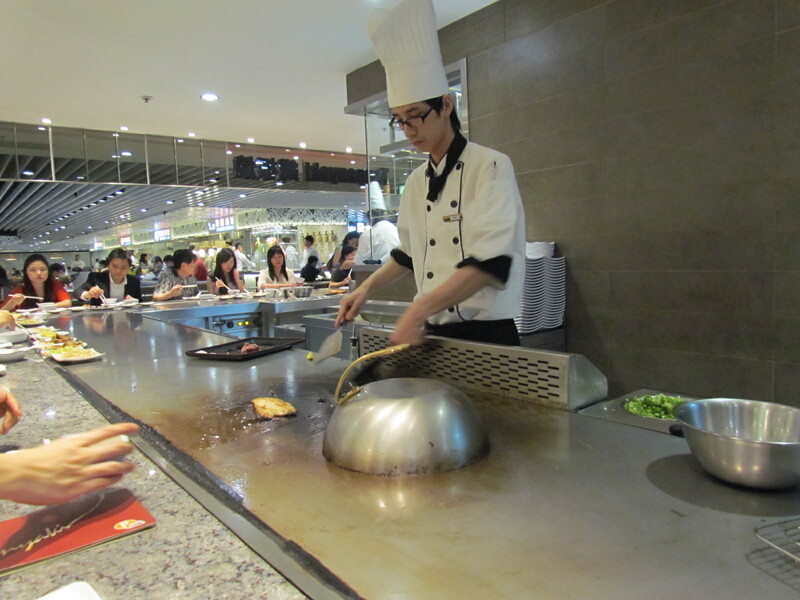 The chef at work on the teppanyaki hot plate with customers sitting all around & eating. Unlike the little teppanyaki tables in Gurgaon Dine Esty & Oriental Bloom, the teppan table at City plaza was huge – from one end to the other. People were constantly coming in & were led to chairs along the bar-like table attached to the teppan. I ordered a seafood & beef combo that cost me HK$150 (approx. Rs. 1000) – cheaper than such a combo in Gurgaon (if u calculate the quantity & the variety). The food is made in front of u one by one & served. That ensures that the food is piping hot & u get to taste diff things one by one. The assorted seafood was great to taste. I always like the fresh seafood variety, taste & flavor in Hongkong – Its never as good back here in India except in some specialty 5 star Restaurants. The fish was slightly crispy outside & super soft, flaky & juicy within. Too good. 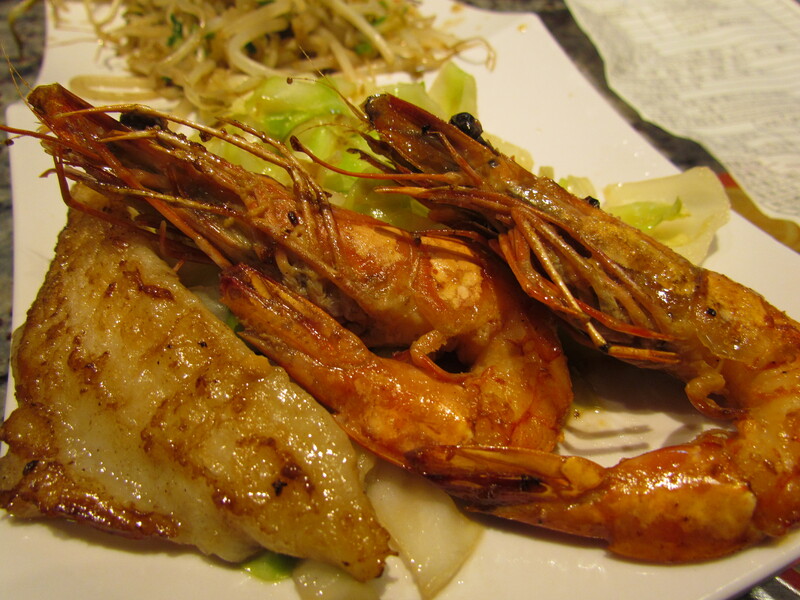 Super loved the jumbo prawns in terms of taste, texture & flavors. 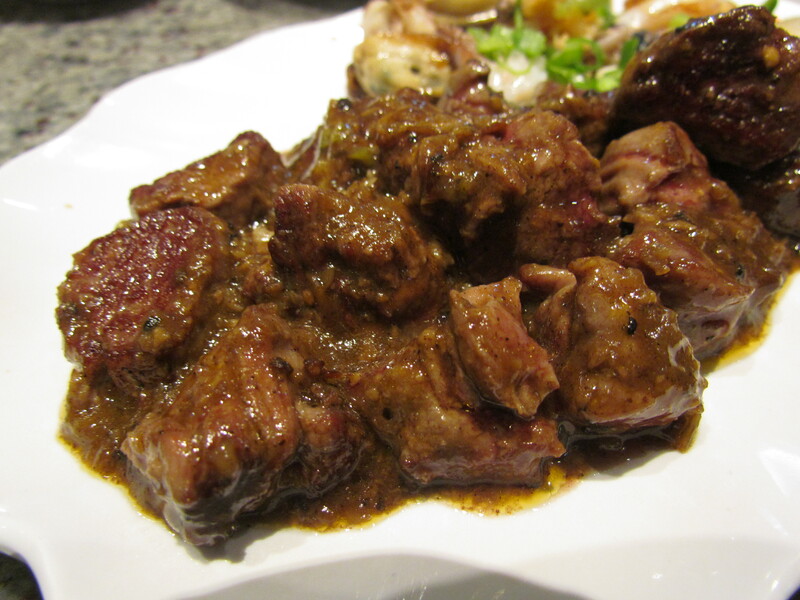 The tenderloin was amazing – crispy fried on the outside & soft n juicy inside. Quite unusual. The sauce was very enjoyable as well. 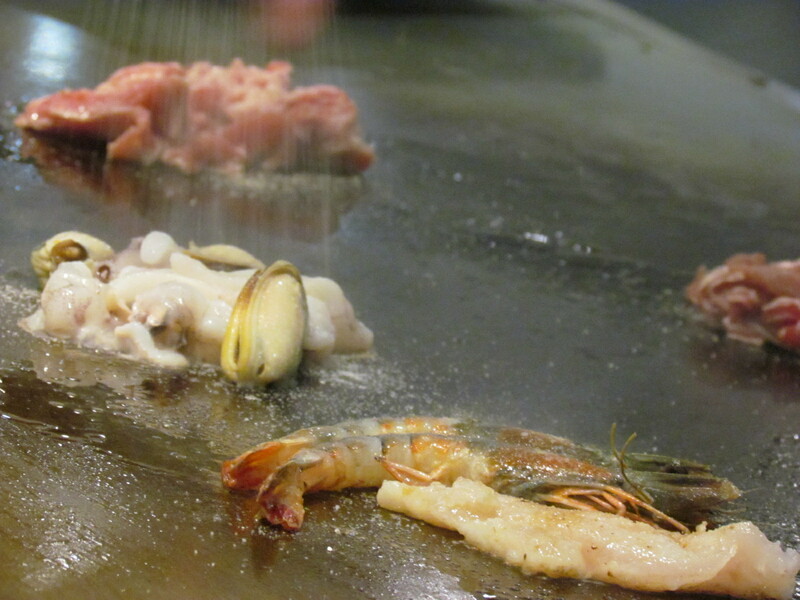 The only issue in the whole process was that all the items at Teppanyaki counter was sub-optimally salted. All I had to do was to sprinkle some salt to adjust my taste. 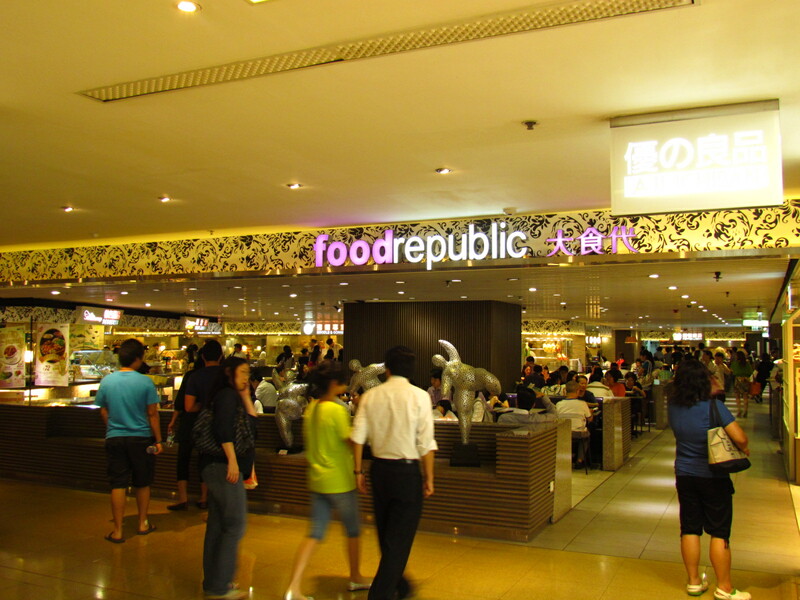 Look forward to getting back & trying more dishes at City Plaza, Hongkong in future & earnestly hope someone opens such a food court in India – even if it is on a much smaller scale.